Great music, great friends and supporting a great cause – what could be better? 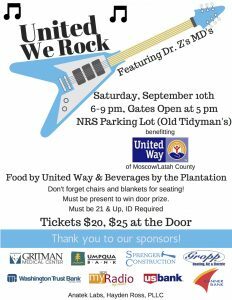 Join United Way for United We Rock featuring Dr. Z’s MD’s, Saturday, September 10th! Gates open at 5 at the Old Tidyman’s building! Get your tickets today from Umpqua Bank or any board member, tickets are $20 in advance and $25 at the door. All proceeds go to benefit United Way and the 19 Non-profits they support. Thank you to Umpqua Bank, Sprenger Construction, Banner Bank, Gritman Medical Center, US Bank, Gropp Heating, Air & Electric, Washington Trust Bank and Inland Northwest Broadcast for supporting this great event. We’ll see you Saturday 10th at the old Tidyman’s for Dr. Z’s MD’s!